Hey! I'm new here and I'd like to intruduce myself. My name is Daphne (yes, no joke) and I'm Dutch. Frasier helped me through a tough time a few years ago and ever since I can't stop watching the series over and over again. S01 - S07 are my favorites. I really don't know what to tell you about myself... Anyway, you'll get to know me soon enough I think. Welcome! It's a bit quiet at the moment but hopefully everyone will get back from their holidays and start posting again soon! Hello, Daphne! Glad to have you on board and hope you like it here . I already do! Thank you! Welcome to the forum! As you can see the forum is still in it's infancy. But it's growing and thriving! Yes it's a bit quiet around here lol... but still very enjoyable. And nice people as well! Thanks. I'm Joyce, 30 years young and I'm also from The Netherlands. Been a fan of Frasier for quite a few years now (dunno how long exactly) and was a member of several Frasier forums. If it's not too much trouble, could you replace your moving avatar by a non-moving one? After a while I find this kind of thing quite painful to watch and averting one's eyes doesn't do much to alleviate the discomfort. So could you please change it soon, I can't stand it already. Oh my goodness. 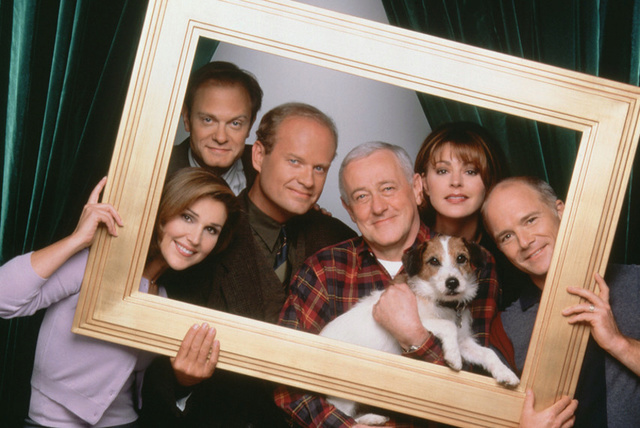 Would you be that lovely person on YouTube who had at least two channels and posted Frasier episodes all the time? Frasiervideosjos? Later had the Frasier Paradise website? If so, you are the reason I got addicted to Frasier in the first place and you're definitely my hero . I wish! I do have a Youtube channel but the funniest thing on there is a video of my brother falling of a horse. And I'm too much of a dinosaur when it comes to setting up websites and things like that. Ah, well, never mind . This person is something like a celebrity to me, heroically uploading Frasier even after YouTube started deleting dozens of his videos. Anyway, I'm glad to have you on board . Is Frasier especially popular in the Netherlands? Not really sure... I know a few people who are addicted like me but not that many. Don't think half of the people over here know what Frasier is about. I saw a lot of complaining each time a channel aired the reruns again. Frasier has a specific kind of humor and I think a lot of Dutch people don't appreciate that kind of humor or just don't get it. I need to get something of my chest. It's about PistolPoet and PatrickD. Communication needs a bit of subtlety imo. So people don't need to insult each other. I've never been on a forum where people show their dislike like this. Can we at least try to act like adults and fight in personal messages instead of in public topics? For instance, PatrickD... you could have sent me a personal message about my avatar. It's kind of embarrassing to complain about things like that in public. I don't know you or PistolPoet, but that's just my opinion. If this happens too often, I may unregister myself here. Sorry for all of this. I'm really sorry if I made anyone uncomfortable. I just thought I should explain why I didn't see Patrick's post, and I certainly didn't mean for it to taint the good cheer around here. I promise it won't happen again . And Daphne, you just can't leave, you've become a regular and you contribute so much to the forum! I'm sure we can all coexist in peace and harmony (I'm a bit of a hippie ). Haha I'll send you a PM just not to annoy anyone anymore. And I like it here too much. I've always wanted to do this, so......Hi Daphne!! Such a beautiful name. I think the name "Daphne" contributed a lot to the character in the show. It's memorable and interesting and not at all a common name. Now that I think about it, all the names of the characters could be described in that way -in my opinion. A name can send a powerful message and I think the scriptwriters knew that intrinsically when they chose them. It's automatic that I read that in Frederick's voice! Hahaha. Very good. Almost forgot about his crush.